WOW! Women On Writing Blog: The Literary Ladies' Guide to the Writing Life by Nava Atlas, Blog Tour & Book Giveaway! The Literary Ladies' Guide to the Writing Life by Nava Atlas, Blog Tour & Book Giveaway! Have you ever been asked the question, "If you could invite 12 people--living or dead--to dinner, who would they be?" Author Nava Atlas's latest book, The Literary Ladies' Guide to the Writing Life, is the literary version of that dinner party. Using their diaries, letters, memoirs, and interviews, Atlas has compiled writing advice from a dozen successful female writers. Her "dinner party" includes Louisa May Alcott, Jane Austen, Charlotte Brontë, Willa Cather, Edna Ferber, Madeleine L'Engle, L.M. Montgomery, Anaïs Nin, George Sand, Harriet Beecher Stowe, Edith Wharton, and Virginia Woolf. Nava's own insightful commentary lifts the curtain on these women's lives and provides reassuring tips and advice on such subjects as dealing with rejection, money matters, and balancing family with the solitary writing process that will resonate with women writers in today's world. This inspirational book is punctuated with photographs, letters, drawings and other illustrations. It makes a splendid gift book for writers or yourself. Just view the book trailer (designed by the author herself!) below. Book Giveaway Contest: If you'd like to win a copy of The Literary Ladies' Guide to the Writing Life, please leave a comment at the end of this post to be entered in random drawing. The giveaway contest closes this Thursday, March 24th at 11:59 PM, PST. We will announce the winner in the comments section of this post the following day, Friday March 25th. Good luck! The book is available for purchase at Amazon.com, Barnes & Noble, Borders, Indie Bound, and at bookstores nation wide. 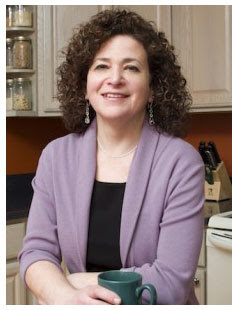 Nava Atlas is the author and illustrator of many well-known vegetarian and vegan cookbooks, including Vegan Express, Vegan Soups and Hearty Stews for All Seasons, The Vegetarian Family Cookbook, and The Vegetarian 5-Ingredient Gourmet. Her first book was Vegetariana, now considered a classic in its field. In addition, she has published two books on humor, Expect the Unexpected When You're Expecting! (A parody), and Secret Recipes for the Modern Wife. Nava is also a visual artist, specializing in limited edition artist's books and text-driven objects and installations. Her work has been shown nationally in museums, galleries, and alternative art spaces. Her limited edition books are housed in numerous collections of artist's books, including the special collections libraries of The Museum of Modern Art (NY), National Museum of Women in the Arts (Washington, DC), National Library at the Victoria and Albert Museum (London), Brooklyn Museum, Boston Museum of Fine Arts, and dozens of academic collections. Learn more about Nava's work at VegKitchen.com and NavaAtlasArt.com, in addition to LiteraryLadiesGuide.com, and connect with her on Facebook and Twitter. WOW: Welcome to The Muffin, Nava! We're thrilled to be launching your tour today. The Literary Ladies Guide to the Writing Life is an unusual idea. How did you come up with the concept? Nava: Aside from being a writer, I'm also a visual artist, and I've long been fascinated with the creative process, especially for women, who have historically had to struggle a great deal to have a presence in the arts. Not surprisingly, women writers are more likely to muse on all aspects of the creative process. At first I was just going to collect inspirational quotes and short passages to put together into a simple book, but as I delved more into their personal narratives, the project grew larger in scope, to include longer narratives from their letters, journals, autobiographies, and interviews. I was then compelled to comment on these musings with my own, weaving in thoughts on how the experiences of classic women writers past still resonate with women who write today. WOW: Why did you choose the 12 women you featured? Do you have a favorite? Nava: I started out with a few others, but narrowed it down to 12—a solid, round number that allowed me, in the space of a 192-page book, to reveal enough so that the reader feels they've gotten to know the women behind the classic books. I chose authors who left a fair amount of writing on various aspects of their lives as writers. I suspect that Jane Austen did a lot more "writing about writing" than we're left with, as a majority of her letters were, sadly, destroyed. But I just couldn't imagine not including her, as she has influenced so many writers, and found enough nuggets to scatter throughout most of the chapters. I would have liked to include Zora Neale Hurston, but couldn't find quite enough in her personal narratives on her writing life. She was a talented, innovative artist of the written word, and bold and open on matters of race and identity in an era when it wasn't as acceptable to do so. I fell in love with some aspects of all twelve authors, and as readers will see, each represents a certain theme or struggle inherent to the writing life. For example, Louisa May Alcott is so much about earning a living by the pen, rather than being an artiste; Edith Wharton's theme is overcoming lack of self-confidence; Madeleine L'Engle exemplifies perseverance throughout dry years of constant rejection; and so on. I don't lock them into these themes, as all twelve appear throughout the chapters of the book, but I did identify each author with a standout quality. If I absolutely had to name my favorite, it might be Charlotte Brontë. She wasn't always successful (her first novel, The Professor, never found a home during her lifetime, though it was published after her death), and came off sometimes as rather prickly, but there was something in her steely determination that I admire. She seemed like a person who wouldn't take &@!# from anyone, and always spoke her mind. That being said, I just gave up on her novel, Villette. Each sentence is so exquisitely crafted, but the story fell apart in the middle for me and I just couldn't bear to go on! WOW: I enjoyed the “steely determination” in many of the authors your book features. Even when they were being polite and ladylike you could sense an underlying THIS is the way it’s going to be. It seems you must have had your own determination to get published in three vastly different genres. Did you worry that starting as a cookbook writer would pigeonhole you? Nava: When I got my first book contract I was still in my 20s, very naïve about the publishing world, and just thrilled that I was going to get a book contract. I was working as a freelance illustrator and graphic designer and didn't fashion myself as a writer per se, even though I've always loved to write. So the thought of being pigeonholed didn't cross my mind. After the first book was published, and was fairly successful, I kept getting (and still keep getting) cookbook contracts, as it seemed an easier and in many ways more gratifying way to make a living than the job-to-job existence of a freelance illustrator. Writing vegetarian, and more recently, vegan cookbooks also really squares with personal ideals that I hold dear. But yes, one does get pigeonholed. Jumping from one niche to another is tricky. It's hard to build a platform in two or three niches. Not impossible, but tricky. The two humor books I did (Expect the Unexpected When You're Expecting!, a parody of the renowned but controversial pregnancy "bible" and more recently, Secret Recipes for the Modern Wife, a satiric look at contemporary marriage, designed to look like a 1950s cookbook) were hugely fun to do, as I love humor and satire, but I can't say that either were best sellers! And when my agent was pitching The Literary Ladies' Guide to the Writing Life, I'm reasonably sure that a few editors said something like, "not interested in this, but does she have a cookbook proposal we can look at?" Edith Wharton did a book on house decorating and one on Italian gardens, I believe, before she started getting her fiction published. Rather than pigeonholing her, the first two publications opened some doors for her. So I take comfort in that! WOW: What made you decide to break out of cookbooks to humor and now nonfiction? Any fiction writing in your future? Or perhaps Italian gardens? Nava: I don't think it's something I consciously decided, it was more about pursuing a notion and seeing where it led. I had tried to write two novels in the past, but gave up when it started feeling too hard. One of the most comforting things I learned from the Literary Ladies and other authors I quoted in the book is that indeed writing does often feel hard, and that in itself isn't a reason to give up. That lesson learned, aside from continuing to do visual nonfiction for women, I'd like to try my hand at a graphic novel. I've started to research it already; it touches on a lot of subjects of interest to me—issues of gender, race, and class; food; and the aesthetic of the 1940s and 1950s. WOW: Nava, you’re a constant surprise! Could you tell us a little about the path to publication for The Literary Ladies? Nava: The original proposal was almost bought by my longtime cookbook editor, but just as she was about to make an offer, there was a huge layoff of editors at Random House, including her, and that was the end of that. My agents then sent the proposal to couple of other editors I'd worked with in the past who really liked the project but felt for one reason or another that it wasn't right for their house or imprint. We first started shopping the project at the end of 2008, just after the stock market plummeted and things everywhere seemed pretty gloomy. They just kept sending it around, and I can't tell you how many times it was "almost yes." So it took a year to find a good home for the project. It finally went to Sellers, a company that has been named one of the fastest-growing independent publishers for the past few years by Publisher's Weekly. The proposal they bought was similar in spirit to the finished book, but it's much more fleshed out, and while the proposal was in two colors, the printed book is full color, a decision promoted by the publisher. My editor continually urged me to turn up my voice. At first I felt quite shy about commenting on what these eminent authors had written. You know, the "who am I to..." syndrome so many women suffer from. But as I got into it, I lost, if not my humility (as writing about such authors is a humbling experience), then at least my shyness, as my editor kept reminding me that it was my commentary that was making the book relevant to present-day writers, whether aspiring or seasoned. WOW: You've written cookbooks, humor, and nonfiction for writers. Do you find that each book niche demands different marketing? Nava: I do think each type of book demands a different type of marketing plan. I've been in the vegetarian/vegan cookbook niche, and my name is known in that market, so I find I actually don't have to work all that hard any longer when a new cookbook comes out. I know so many of the veg authors and bloggers out there, if not in "real life," then via the web, and we tend to be very supportive of one another to get the word out there about new books. Humor is a very tough niche to market, unless you're a known name, like Dave Barry or Amy Sedaris; it's because your audience is not readily identifiable as a demographic or even an interest group. So now, I'm entering an entirely new niche, reaching out to writers and literature geeks (an affectionate term I apply to myself as well), and we'll see how I fare here. I would say though, that with all the writer's groups, publications, centers, sites, and blogs, it is a niche that seems eminently reachable, so I'm optimistic that The Literary Ladies' Guide to the Writing Life will find an audience. WOW: In addition to your WOW Blog Tour, what else are you doing to promote The Literary Ladies? Do you have one great marketing tip you'd like to share with our readers? Nava: I'll be doing readings at libraries and bookstores; the schedule is still taking shape, but those interested can go to the Literary Ladies' web site (http://www.literaryladiesguide.com). My publisher is sending out review copies to the usual mainstream media outlets plus some specialty publications; I designed a trailer (the first I've ever done; I had my webmaster animate it and set it to music), which is on the home page of the same site, and getting people to share it. My friends in the food world have even offered to do promotions on their very popular blogs, even though for them, it's off-topic. Even though these blogs are about vegan food, when you think about it, every blogger is a writer, and they're all willing to help promote the book! Interestingly, one of these talented food bloggers is an English instructor at a college and did her doctorate on Katherine Anne Porter, who isn't one of the twelve literary ladies, but I quoted her a few times in my commentary throughout the book. WOW: Serendipity, I suppose! Besides your writing you have so many other creative outlets. Do they positively affect your writing? Help stave off writer's block? Nava: I'm also a visual artist; I make limited edition books and text-driven objects and installations (http://navaatlasart.com). Everything I do in some sense involves both words and images, a fact of my life ever since I was a small child. I'm lucky that I can dash from one creative outlet to the next. Even cooking is a creative outlet. I'm all about simplicity in the kitchen, and prefer meals that yield the greatest rewards (in terms of flavor, health, and visual appeal) with the least amount of effort. So constantly making things, whatever form they take, is a kind of practice that does stave off blocks. Nava: Well, let's see how I can do with the aforementioned graphic novel. Aside from that I have two vegan cookbooks coming out in the near future: Vegan Holiday Kitchen (fall 2011) and a cookbook on all the leafy green veggies people love so much these days, as yet untitled, in the spring of 2012. I'm going to devote more time and energy to my art career; I have a few exhibits on the horizon. For all those who are interested in the food, art and book aspects of my triangulated career, you can keep posted on events and news on my Facebook author page: http://www.facebook.com/pages/Nava-Atlas/67621864858. Thanks for the great questions, Jodi. When I get to put my thoughts down in writing like this, I'm always reminded of the quote by Joan Didion that goes, "I write entirely to find out what I'm thinking..."
WOW: I think that’s a wonderful thought for all of us to keep in mind. And we’re looking forward to learning what you’ve been thinking! Join Nava on her tour! Check out these dates and mark your calendar! You can also snag a copy of WOW's Events Calendar HERE. March 23, Wednesday @ Musings from the Slush Pile: Julie loved Nava Atlas's book of writing advice from classic female authors so much she's featuring The Literary Ladies today and tomorrow. Stop by today for Nava's post on dealing with literary rejection. March 24, Thursday @ Musings from the Slush Pile Day 2: Day Two features a review and giveaway of her book The Literary Ladies Guide to the Writing Life. March 25, Friday @ The Urban Muse: Today we celebrate failures! Although we all strive for success and shun failure, writer Nava Atlas tells us why failure is just as important as success. March 28, Monday @ Crafting Fiction: Nava Atlas discusses a trait so many writers lack, self-acceptance. She's also giving away a copy of her latest book The Literary Ladies Guide to the Writing Life. March 29, Tuesday @ Writers Inspired: Don't miss Mary Jo's interview with author Nava Atlas--she'll be telling us how she learned from classic female authors. Stop by and tell us your favorite classic author! March 30, Wednesday @ Ink Thinker: Kristen King reviews a book of literary advice culled from famous authors' letters, journals, and interviews: The Literary Ladies' Guide to the Writing Life by Nava Atlas. March 31, Thursday @ Colloquium: I think I can! I think I can! According to Nava Atlas, just like the little train that thought he could, writers should never give up just because the job is difficult. Need an encouraging boost? Stop by today! April 2, Saturday @ Writer Unboxed: We laugh when actors or actresses look foolish when faced with fame. What about authors? Author Nava Atlas posts about dealing with fame--even if we don't have paparazzi outside our window! April 4, Monday @ WordCount: Stop by Michelle Rafter's blog for a peek into the lives of a dozen female writers. April 6, Wednesday @ The Book Tree: When you write, what do people hear? Stop by for the Don't Whisper, Don't Blather! The Literary Ladies on Finding Your Voice post by Nava Atlas and a review of her latest book, The Literary Ladies' Guide to the Writing Life. April 7, Thursday @ Nia Promotions Podcast: Don't miss an audio interview with Nava Atlas. Interviews with Dana are always unpredictable and fun! April 11, Monday @ The Other Side of the Story: Nava Atlas will be the guest blogger at The Other Side of the Story's feature "How They Do It," giving us insight into some classic female authors. She'll also be giving away a copy of her latest book The Literary Ladies' Guide to the Writing Life! April 12, Tuesday @ Words by Webb: Stop by for a review of The Literary Ladies' Guide to the Writing Life and a 5Ws interview with author Nava Atlas. April 13, Wednesday @ Cathy C.'s Hall of Fame: Cathy Hall, lover of children's books, has a few questions for Nava Atlas about the children's authors she's included in her list of literary ladies. Book Giveaway Contest: Remember, if you'd like to win a copy of The Literary Ladies' Guide to the Writing Life, please leave a comment below, or ask Nava a question, to be entered in random drawing (via random.org). The giveaway contest closes this Thursday, March 24th at 11:59 PM, PST. We will announce the winner in the comments section of this post the following day, Friday March 25th. Good luck! This sounds like a book that would make the perfect gift for a friend...Wait, that means I would not be able to keep it! Forget about it being a gift. I'll try again. This sounds like a book I would love to keep for myself! I can't get enough books on writing in my life. I'm in! A delightful interview and a book that sounds inspirational. I can only image the process, Nava, that it took to narrow down the offerings. I, too, would get caught in the research and spend all my time reading about more and more women. So many women inspire me! That's why i chose my motto of "Writing Strong Women." I especially liked Nava's description of the challenge to crossover to a new genre and her courage in making the leap to nonfiction. The book seems very inspirational and I look forward to reading it. great interview! Very inspiring — and I love the book trailer! Sounds like a great read! Boy, if I had to choose 12 women, I would be hard-pressed to narrow it down...too many amazing women writing today, as well as in the past. This sounds like a grat read for writers! So enjoyed the background story to the book. Really enjoyed reading this interview. What a great creative life Nava Atlas has! The Literary Ladies' Guide to the Writing Life sounds like a book I would enjoy very much. The act of writing is simple in and of itself, but the endless possibilities it offers are what makes it so compelling. It's a yielding art, conforming itself to whatever niche--large or small--we wish to give it in our lives. This book sounds so great! Nava-I liked when you said your editor told you to "turn up your voice." I recently had a friend tell me the same when I was writing a contest piece. I look forward to reading this book! Thanks WOW for sharing Nava with us! Wow, what a Rennaissance Woman Nava is! Inspiring and intimidating at the same time. Hope this book gets lots of positive attention! Definitely a must-buy book for me! (or win!) I loved this interview, too. I'll have to check out the rest of your tour for more! How do you find time to research and write when you have so many other obligations. As a writer myself, I wish you every success with this new endeavor. I would love to read what these masters have to say about writing! I am so buying this book if I don't win a copy here. My home library is full of amazing books on writing. In fact, I can attribute my success as a full-time freelancer to the men and women whose books I have read. Can't wait to read it. What an amazing story you have Nava. I admire all the strong, inspirational women writers you mentioned so much. Thank you, WOW, for introducing me to Nava. Oh, how I would love to own this book! Thank you for leaving your kitchen and entering my office. Reading the lives of other authors inspires me. May you be blessed! What an interesting concept! I would love to read this. I'm interested in what meal you'd prepare for the 12 too! This was a wonderful interview and the book sounds fantastic. I'd love to win a copy to give to one of my writing friends; I'm buying my own! :) Congrats on the new book, Nava--and the the leap into different literary waters. Just reading about this book was inspirational! You hooked me, Nava! You selected all women I have enjoyed reading over and over again. Now I can learn more about their lives. I look forward to reading your book and giving copies away to my writer friends as gifts. My mother, who is in her 80s, has always been a big fan of Alcott, so I'd love to attend that dinner with all these wonderful writers and bring her along! This book sounds very interesting and I'd love to win a copy of it. This sounds like an amazing book! I can't wait to read it. Nava's experience shows how adaptable writers must be to succeed. Sounds like a yummy book! Intriguing interview. I am eager to read your book. I think reading about the triumphs and challenges of great authors gives us writers insight into our own thought processes and offers courage along the erratic road to publication. Enjoyed reading about your eclectic writing life. I could relate to that because some people call me "creative". When what I really am is adaptable. Most of my ideas come from others through watching & listening. I love taking an idea & seeing where it will go. Like growing a plant, the satisfaction comes when it blossoms. I'm eager to hear your thoughts on self-acceptance & more on the writing "keys" from the 12 literary ladies. Wouldn't it be great for the Literary Ladies to have a lunch set by Judy Chicago. Thanks for all your kind comments and interesting thoughts, everyone! I'm looking forward to hearing more. A couple of people asked what I would serve the Literary Ladies. Not surprisingly, many authors, male and female, were foodies. Virginia Woolf said, "One cannot think well, love well, sleep well, if one has not dined well." I would serve the Literary Ladies the same kind of meal I serve any guests in my home: Seasonal, colorful, simple, and 100% vegan. The concept of being vegan was not present in most of their lifetimes (though Alcott's family briefly toyed with vegetarianism in their utopian community, Fruitlands) so I would have a great time explaining the reasons for it. I will readily admit that I need some pointers for writing. I'm constantly distracted by life - and the time in front of the computer writing is what suffers. So bring on the pros and let me learn from them! My question is: Did you need permission from their estates to get access and use their private material? A personal note: Years ago, I was honored to be a member of M. L'Engle's writing workshop and so pleased to see you included her as one of the 12 writers. She would have been "tickled pink." Your interview of questions and answers is very important to us that struggle as newbies each day in creating. I would certainly benefit to have this book in my library. I'd love to win this book for sure. Thanks for offering it, and the opportunity to win. I hope I win! What an amazing collection of inspirational text by an inspiration herself. I LOVE hearing about and from women writers who are also artists and who stretch beyond the bounds of what the world says is possible for creative people. Thank you for your great example, Nava!! Looks like an excellent book! I would love to win it! Another round of thanks for the comments after my previous response! Lora Mitchell, I did have to do a lot of permission seeking. Though all the Literary Ladies are deceased, some of their estates are alive and well (Edith Wharton, Madeleine L'Engle, Anais Nin, etc) while others' writings are in the public domain (Alcott, Stowe, Austen, etc.). That whole permission-seeking and acknowledging is quite tedious and I'm going to try to avoid having to do it in the future! And how cool that you got to study with L'Engle. As Alisha pointed out she did some great writing on the writing life. Sounds like an inspiring read. Thanks for writing and I look forward to reading it! Sounds exquisite! Can't wait to read the book. What a great idea. It's got my attention. Sounds like an excellent book. The quote by Joan Didion that goes, "I write entirely to find out what I'm thinking..." fits me like a spandex glove. I want, no, need to read the book. I am sure many of the things that drove the women of the book will also fit me. It will be an inspiring read. Love books on the writing life. Thanks for the giveaway! Next to writing and reading books, my favorite thing is to read about others who write. Would love to have a copy of this book! Looks fab, can't wait to read this book for some much-needed inspiration! I'd love to win the Literary Ladies book. Please toss my name into the hat! Great interview, fascinating to hear about Atlas' three niches. Would love to win the book! This sounds like it would be a great addition to my library shelves. A perfect dose of inspiration to leave right out on the coffee table! I think this book must have been written with me in mind. I can't wait to read it. I enjoyed the interview. I can't wait to read this book! Looks like a great book! I'd be interested in reading it, even if I don't win. As a writer, I'm always looking for inspiration and ways to improve my writing skills, this sounds like a great book! I would love to have this as part of my own library and share with my other writer friends. Best wishes, Nava on your publicity tour and getting published. Such an interesting group of women you chose. I just know it will be a very interesting book to read. This sounds like a fascinating book. I fancy myself a writer and love to gain insight into how other writers think. We held a random drawing via random.org and the winner is...Cyndi Pratt! Congratulations, Cyndi, you've won a signed copy of The Literary Ladies' Guide to the Writing Life by Nava Atlas. You're going to LOVE this book! Please e-mail us at blogtour@wow-womenonwriting.com with your mailing address.